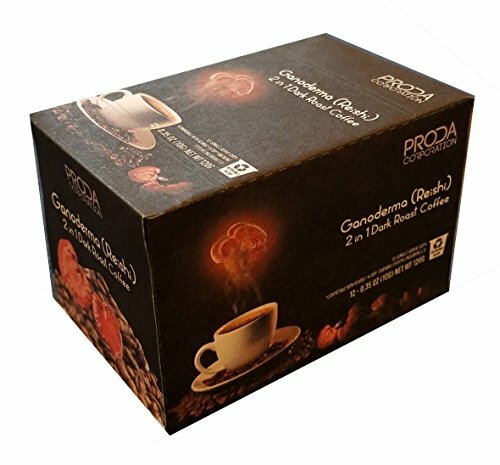 Ganoderma (Reishi) Single Serve K-cup Pods for Keurig Brewers Dark Roast Coffee by Proda Corporation at Rae Of Sunshine Life. Hurry! Limited time offer. Offer valid only while supplies last. 12 cups per pack. This healthy coffee contains 5-6 times more Ganoderma extract than comparable instant coffee products currently on the market. Ganoderma, Chinese 靈芝 (Lingzhi), Japanese 靈芝 (Reishi), Korean 영지,灵芝 (Yeong Ji) is a mushroom used for wellness and medicinal purposes in the East for over 2000 years. Multiple studies have confirmed the mushroom's anti-aging and anti-cancer properties. It has also been found to help in maintaining healthy immune and cardiovascular systems, and regulating blood pressure and cholesterol. This healthy coffee contains 5-6 times more Ganoderma extract than comparable instant coffee products currently on the market. The only healthy coffee on the market containing ganoderma supplement in K-cups. If you have any questions about this product by Proda Corporation, contact us by completing and submitting the form below. If you are looking for a specif part number, please include it with your message. By JING SHENG YU CO., LTD.